The Resistance! : Is Obama His Brothers Keeper? Senator Barack Obama's long lost brother has been tracked down for the first time living in a shanty town in Kenya, reports claimed. 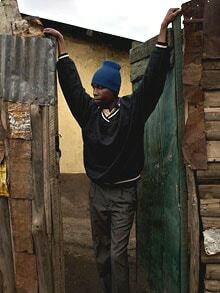 George Hussein Onyango Obama, Senator Barack Obama's long lost brother was tracked down living in a hut on the outskirts of Nairobi Photo: Guy Calaf, Vanity Fair, Italy The Italian edition of Vanity Fair said that it had found George Hussein Onyango Obama living in a hut in a ramshackle town of Huruma on the outskirts of Nairobi. Mr Obama, 26, the youngest of the presidential candidate's half-brothers, spoke for the first time about his life, which could not be more different than that of the Democratic contender. "No-one knows who I am," he told the magazine, before claiming: "I live here on less than a dollar a month." According to Italy's Vanity Fair his two metre by three metre shack is decorated with football posters of the Italian football giants AC Milan and Inter, as well as a calendar showing exotic beaches of the world. Vanity Fair also noted that he had a front page newspaper picture of his famous brother - born of the same father as him, Barack Hussein Obama, but to a different mother, named only as Jael. He told the magazine: "I live like a recluse, no-one knows I exist." Embarrassed by his penury, he said that he does not does not mention his famous half-brother in conversation. "If anyone says something about my surname, I say we are not related. I am ashamed," he said. For ten years George Obama lived rough. However he now hopes to try to sort his life out by starting a course at a local technical college. He has only met his famous older brother twice - once when he was just five and the last time in 2006 when Senator Obama was on a tour of East Africa and visited Nairobi. The Illinois senator mentions his brother in his autobiography, describing him in just one passing paragraph as a "beautiful boy with a rounded head". Of their second meeting, George Obama said: "It was very brief, we spoke for just a few minutes. It was like meeting a complete stranger." George added he was no longer in contact with his mother and said:"I have had to learn to live and take what I need. "Huruma is a tough place, last January during the elections there was rioting and six people were hacked to death. The police don't even arrest you they just shoot you. "I have seen two of my friends killed. I have scars from defending myself with my fists. I am good with my fists."